The weather is truly taking a turn for warmer, sunnier days, making it the perfect time to enjoy a big juicy burger outside with friends. Veggie burgers come in all shapes and sizes and can be fun and easy to make. These recipes come from local nutrition expert and registered dietitian Lindsey Kane, MS, RDN, LDN. 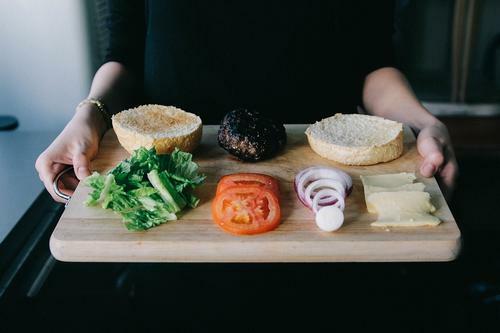 Lindsey visited the Culinary Literacy Center in February and shared with us a few healthy and delicious ways to create homemade veggie burgers with globally inspired flavors. Most of the ingredients may already be in your pantry or leftover from a previous meal. She suggests you use these recipes as a guide, but in the end trust your judgment and have the confidence to make substitutions. She believes cooking should be intuitive, simple and fun. Pro Tip: Wrap the pre-made burgers in freezer paper and freeze for later! For more information about Lindsey's philosophy and work, visit biteforchange.com. Stir-fry the garlic, ginger, scallions, and shitake mushrooms with 1 tbsp of Chinese 5-spice powder. Set aside and allow to cool. Next, mash together the sweet potatoes and ½ cup legumes. Stir in tahini, miso paste, 1 tsp toasted sesame oil, and 1-2 tbs chopped cilantro and mix to combine. Gently stir in reserved legumes, mushroom mixture, and cooked whole grains. Add oats, flour, or any dry ingredient in small doses, until the batter comes together and forms a dough-like texture. Taste and season with salt and pepper and additional 5-spice powder as needed. Mold into patties and refrigerate for 15-20 minutes. Oven: Bake at 375 F for 20-30 minutes, flipping half way through. Stove Top: Heat a skillet over medium high heat with high quality oil and cook for 7-10 minutes, flipping half way through. Mix the plain yogurt, mayo, or avocado with a few squirts of Sriracha. Smear onto burger and top with crunchy vegetables, a few sprigs of cilantro, jalepenos, and finish with a squeeze of fresh lime. Dig in! Mash or puree the roasted garlic, half of the cooked whole grains, chickpeas, and tahini; transfer the mixture to a bowl. Stir in the asparagus, artichokes, olives, sundried tomatoes, scallions, lemon juice, herbs, and remaining whole grains. Add oats or dry ingredients as needed to bind the dough. Taste, and season with salt and pepper as needed. Mold into patties and refrigerate for 15-20 minutes. Stovetop: Heat a large cast-iron skillet with high quality fat and cook for 7-10 minutes, flipping half way through. Top with hummus, pesto or tzatziki, crunchy vegetables, and a squeeze of lemon. Enjoy. Stir fry the garlic, bell pepper, and scallions with chili powder, paprika, and cumin until caramelized but still crisp. Turn off heat and add the frozen corn; toss to combine and set aside to cool. Next, mash together the sweet potatoes and ½ cup beans. Stir in tahini, miso paste, adobo sauce, lime zest, lime juice, and 1-2 tbsp chopped cilantro; mix to combine. Gently stir in reserved beans and sautéed red bell pepper and corn mixture. Add oats, flour, or other dry ingredient in small doses, until the batter comes together and forms a dough-like texture. Taste and season with salt, pepper, and spices, as needed. Mold into patties and refrigerate for 15-20 minutes. Mix the yogurt, mayo, and avocado with a few tsp of adobo sauce. Smear onto burger and top with crunchy vegetables, avocado slices, a few sprigs of cilantro, and pico de gallo, and finish with a squeeze of fresh lime... and contemplate the beauty of time and condiments as Autumn McClintock describes in her poem Unsurpassed.